LilMissStyle Blog > ThreadshowLA Giveaway...Shop Indie with me!! 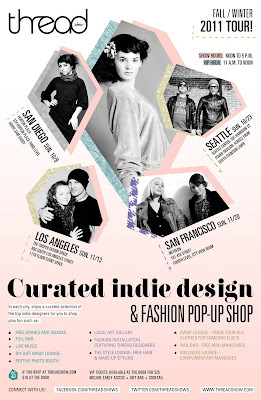 11.07.2011 ThreadshowLA Giveaway...Shop Indie with me!! One important fact about me is that I love shopping indie and supporting emerging fashion designers. I feel they share an unfaltering passion for showcasing their craft, and not to mention their designs are always on point with my personal style. If you're anything like me then you may be happy to hear about great Los Angeles events like ThreadshowLA. They travel various states and hold curated showcases of the best indie fashion, music, and art that locals have to offer. So with their tour slowly reaching a close, im so excited that LA is one of their last stops, and since everyone loves getting great gifts the great people at Threadshow LA and myself are giving away a pair of tickets to two LUCKY readers. So if you want to win the best shopping experience of your life!! Just check out the deets below to find out how to enter. There's 3 ways to win so make sure to read carefully. "I just entered to win #ThreadshowLA tickets from @LilMissStyle1 #blog http://bit.ly/vyZywg"
Third Way: Or increase your chances by do both 1 and 2!! Additional Notes: Must be in Los Angeles, CA on Sunday, November 13th 2011. Winner will be announced 5pm PCT. Hi ! Your blog is wonderfull ! And I follow it naturally.... If you want you can come to visit mine and follow me back if you like it !